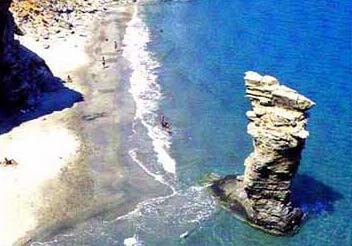 Grias Pidima (old womans jump) lies at the eastern coast in Kothi area. We reach it if from Korthi we follow the coastline to the North. 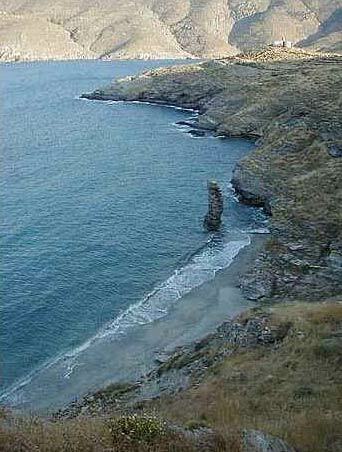 After the port (Vintzi) and the crossing Rogo we continue ahead and we meet the beach on the right. 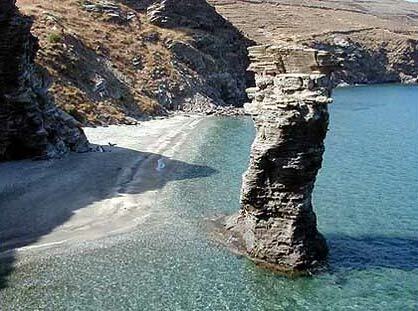 It is a sandy beach with an extraordinary cliff, which gave its name to the beach. According to the tradition the Upper Castle or Kohylou was impassable. The Turks in order to conquer it forced an old woman and her daughter to ask shelter. When the inhabitants accepted them, the old woman opened the gates and the city was conquered. However, the old woman couldn't stand the shame. She jumped over the cliff and was petrified.